Exercising is an important part of senior living because it helps you reduce stress from things like your changing physical health conditions and how they’re making you more dependent on the people around you. Fortunately, there are some simple things you can do when it comes to senior moving that will help you get the exercise you need without ever leaving your home. Of course, before you start any exercise regimen you’ll want to make sure you speak with your doctor first. This is important because they alone know what your true limitations are – ones that you should always build into whatever exercise routine you adopt for yourself. Once you’ve taken the time to do this, you’ll find that there are some fundamental things you can do to help you stay fit and active. Yoga is an important part of senior living because it helps you with stretching. As your daily activities begin to decrease you may find that this is the only reasonable physical activity that you can engage in. Fortunately, there are a lot of different stretching activities available for you to choose from so there’s bound to be something available to fit your fitness level. Senior living not only leads to decreased activities, but this in turn will make your muscles decrease. As they start losing mass, you’ll find yourself growing weaker. This is something you need to pay attention to because muscle mass helps you be more stable so you fall less – something that’s necessary so you can feel confident with exercising and going out and about in public. There are many strength training exercises you can easily do from the comfort of your own home. One of the most important types of senior moving has to do with your balance. This brings together your strength and your stretching exercises so you can be more mobile while also remaining safe in the comfort of your own home. All it takes is one simple fall and you could seriously injure yourself just because your balance isn’t as good as it once was. This may even be something that’s beyond your control since things like osteoporosis can reduce your balance and increase your need for doing more balance exercises. Besides making sure you’re getting plenty of senior moving in your senior living plan, you also want to make sure you take good care of your hearing health. This is important because it can affect how well you’re able to get up and do these exercises. When you’re suffering from hearing issues one of the biggest, yet often most overlooked, ways you’ll see this affect your life is through your balance. Hearing issues can truly throw you off balance, making it “dangerous” for you to live on your own. 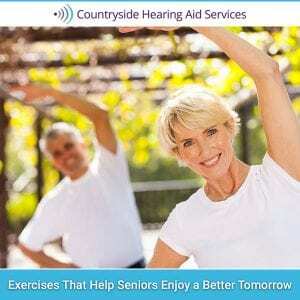 Since this is something you’ll want to be on the lookout for, you should contact Countryside Hearing Aid Services to have them check your hearing and get you any help that you may need. Give us a call today at 727-796-1161.